New School-Home Communication Form has been added to Materials-Forms. 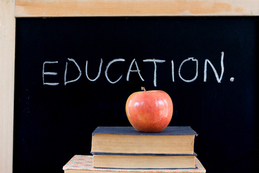 It is a significant revision that a teacher found to be successful. Do the parents of your students have questions about MYD? They can click on the link Parent Information, which includes how MYD developed and questions frequently asked by parents. Not working at a MYD school? There's more information at MYD for Our School? 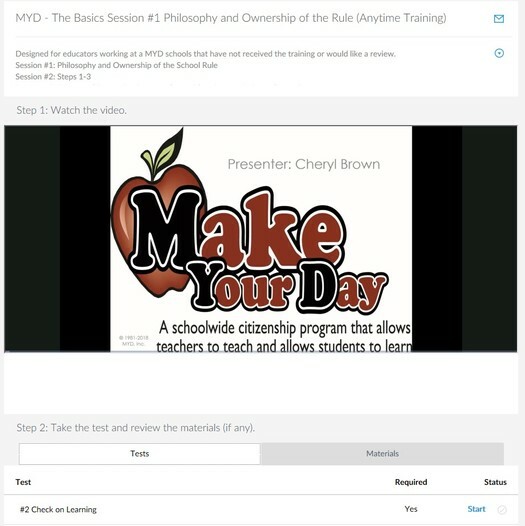 Training designed to support staff new to a MYD school, we are offering a training series that will cover the basic components and processes of MYD that you can "attend" at anytime. Please plan ahead because each registration must be approved so that we have the information to invoice either you or your school. If your school is paying, please disregard the invoice that is sent automatically. Your registration will be marked as paid so you will receive the information and link that you need. Below is a screenshot of the training. There is a video that you can pause as necessary. Below the video are the tabs for the tests and the materials. You will need to download the materials because those links will no longer work once the session is over. Even though I share responsibility for the initial framework, the continuing growth and refinement of the Make Your Day program can be directly attributed to scores of dedicated professionals who continually strive to better the educational process and provide students with life-long skills for success. This website is designed to provide support to schools that use Make Your Day: copyright 1981-2019 MYD, Inc. If you use information, ideas or forms from this website, please credit the school(s) and/or person(s) who designed it.